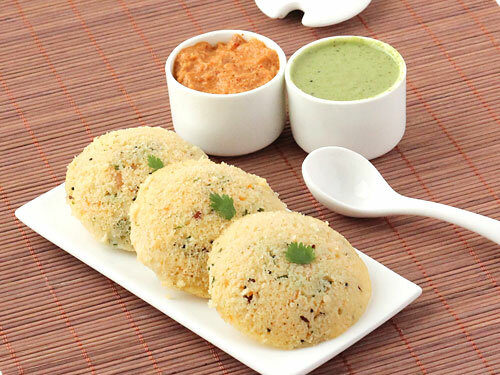 Idli is one of the most popular form of breakfast or all time snack in India. Not just in South India, but all over the country people love to relish on idlis eating it with different kinds of chatnis, sambhars or simple tomato ketchup. This is the reason why idli is available in so many varieties ranging from simple steamed to fried. Today I have a very simple Rava idli recipe that you can make at home any time you like.It is full of healthy vegetables and steamed making it a perfect healthy snack. Let's get started! 1. Heat 3 tablespoons oil in a heavy skillet, add 2 tablespoons mustard seeds, 8 curry leaves and stir. 2. Add 2 tablespoons white lentils, 60 grams carrot, 2 green chili and stir well. 3. Add 350 grams semolina and mix it well. Cook for 3 - 5 minutes. 4. Transfer it into a mixing bowl, add 2 tablespoons roasted cashews, 245 grams yogurt, and mix it well. 5. Add some water, 1 teaspoon salt, 2 teaspoons fruit salt and mix well to combine. 6. 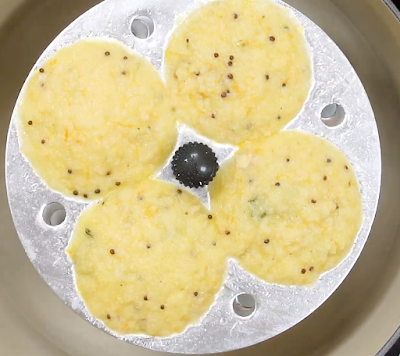 Pour the rava idli batter in greased idli moulds. 7. Place the idli stand in the pot and steam for 10 - 15 minutes. Enjoy your yummy rava idli!